So here is the before…. 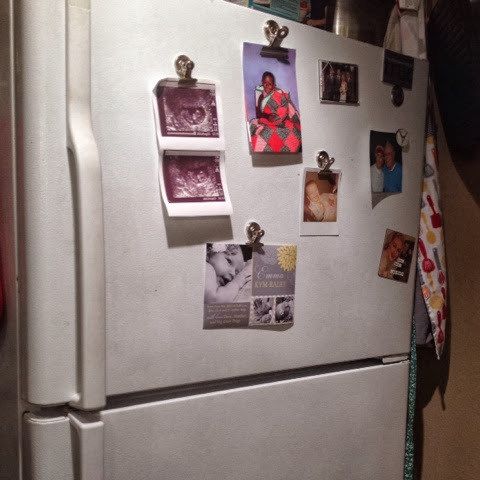 I had recently paired down the photos on the fridge because of the addition of our command center. But still it seemed cluttered and unorganized. In an already very full kitchen I wanted a place to display photos that was more clean cut and finished looking. So after finding some inspiration on Pinterest I set to work. I hit up the Dollar Store and got $7 in inexpensive frames. I chose within the same color scheme as our command center and ones I wouldn’t have to paint. The cute “pin” in Pinterest that had inspired this upgrade went a bit further then I had time or patience to do. She painted them fun colors. Like I said, I was going for the QUICK UPGRADE. I was also careful to select frames that had enough surface on the back for me to glue these magnet strips on with hot glue. They are sticky on their own, but not sticky enough. I had these magnetic strips leftover from when I was teaching. You can get them at craft stores or maybe you will get lucky and find some strong empty magnets at the Dollar Store – I gave seen them there. I disposed of the glass, frame backs and pretend family photos. I considered keeping them in case I didn’t like the new upgrade, so I could use the frames elsewhere, but shortly I realized I had to actually remove the metal pieces that held them in place if I wanted the frames to lay flat on the fridge. Therefore they would be null and void shortly and I’m learning not to hang on to things as much so discarded they were. I tried bending the wee metal holders back and forth to break them off, but that didn’t work. In fact I almost ruined a frame trying. I then tried wire cutters which worked, but this method was killing my wrists after just one frame. So finally actually luckily discovered that with the same wire cutters I was able to carefully just pull them out. Who knew it could be that easy. Once they were removed I glued a substantial length of the magnetic strip (at least a third of the length of that side) onto the back of the frame, and they were ready. Really only took me about 20 minutes and $7!! My kind of upgrade. Here is the final product and I love it!